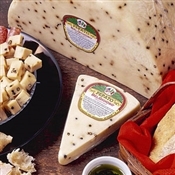 BelGioioso Pepato is a firm Asiago based cheese delicately spiced with peppercorns resulting in a sharp, piquant flavor. In Italian, Pepato means "with pepper". Whole black peppercorns are added to the curd during the cheese making process to create this delicately spiced table cheese. Made with part skim milk, Pepato is aged over 5 months and has a beautiful table presentation. Pepato was recently awarded 2nd place by the 2004 American Cheese Society.